The occasion of Barbara Walters announcing her retirement seems as good a time as any to share this anecdote, one which I still find to be shrouded in some mystery. I teach journalism in a building at Marist College named for the broadcasting legend Lowell Thomas. Thomas found his real fame with his travelogues (the Marist library has a wonderful exhibit on them), in one of which he brought even bigger and more lasting fame to one of his subjects, T.E. Lawrence (of Arabia). He was also a magazine editor, a narrator of newsreels and one of the founders of the broadcasting corporation Capital Cities. I’ll admit that despite being a journalism historian, I didn’t know much about him until taking up professional residence in the building that bears his name. But as happens, once I did, I took up a particular interest in him. Then, a couple years ago, I was in The Strand, one of my favorite book stores, browsing the journalism section (that The Strand has a journalism section is one of the things that makes it a favorite), and I came across a used book: Lowell Thomas: The Stranger Everyone Knows. It’s mostly a collection of anodyne profiles of Thomas, published as a collection in 1968, when Thomas would have been a very respectable 76. Lowell himself wrote the introduction. But it was what was inside that made me really decide to buy the book. It was inscribed by Lowell Thomas himself. And not only that. It was inscribed to Barbara Walters. Barbara Walters! Don’t bother to read except maybe P’s x and 58. Anyway, the volume’s provenance aside, I had to read pages x and 58. When the last celebrity (?) staggered into our Sutton Place elevator or slid down the stairs, I went to my bedroom on the floor above, to calm down, and think over this unexpected catastrophe into which we had stumbled. There sprawled across my bed was as beautiful a blonde as you’d ever hope to see—out cold. Hurriedly I dashed downstairs again, to see if by chance my wife might have gone out to a nearby delicatessen or somewhere. She hadn’t. So, I returned to the bedroom, gingerly tapped the young lady—on her cheek. Whereupon she opened her eyes, and with a startled look, but not a sound, jumped from the bed, dashed for the elevator, and vanished. Could it be? I bought the book and now keep it displayed on a shelf in my office. But a closer reading makes the Barbara Walters interpretation impossible. Allen Smith says the party happened in 1930. Walters would still have been an infant. So why did Thomas inscribe the book this way? Is there some secret to be gleaned from it? I know as a journalism professor that I should investigate, but I like leaving some of the mystery. Still, I think the answer is likely prosaic, embedded in LT’s introduction to the book. I suspect he inscribed every copy this way, saying not that the book was for Person X, but rather for Person X’s shelf. And that those two pages were the only ones worth reading for the same reasons he disclaims all the other chapters—they’re laudatory and he was embarrassed. I believe this was taken shortly after Walters and Thomas defeated the Canadiens to take home the Stanley Cup. I know that Walters and Thomas crossed paths. 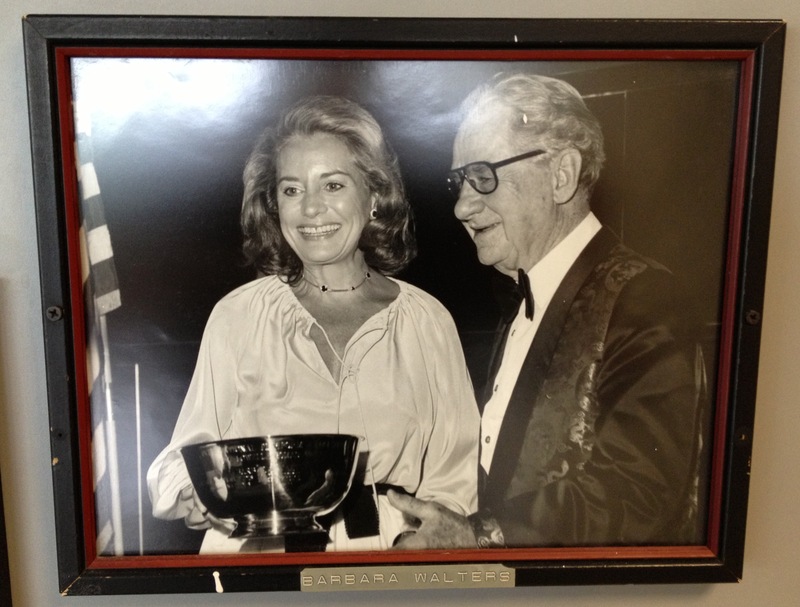 There’s a photograph of them together on the wall of the second floor of the Lowell Thomas Communication Center. It’s part of a collection of photos of LT, tracing some of his history. That wall won’t exist in September, since Marist is renovating the top floor of the building this summer. But it’s good to have my hands on the artifact, to keep a little piece of history in my office—even if there’s no whiff of scandal wafting from it.